Real time 0V – 4.5V analogue output of oxygen electrode signal. The next generation Oxygraph+ oxygen electrode control unit combines striking aesthetics with enhanced features and functionality offering significant advances in flexibility and performance over previous generations of electrode control units. 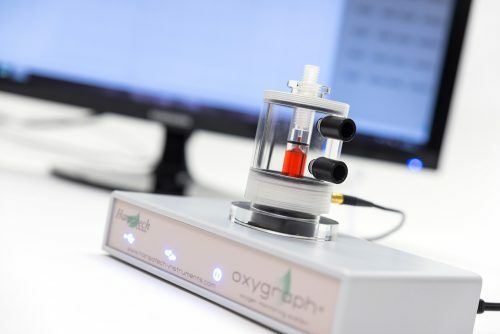 As a complete system, Oxygraph+ provides a convenient yet powerful tool for measurements of oxygen evolution or uptake across a broad range of liquid-phase samples from chloroplast extractions to mitochondrial suspensions with oxygen concentrations up to 100%. Oxygraph+ offers unrivalled price vs. performance combining simplicity of operation with an enviable feature set. The outstanding flexibility ensures Oxygraph+ is equally useful in both a teaching and research capacity. 24-bit resolution allows detection of minute changes in oxygen tension without needing to apply instrument gain. This results in beautiful, noise-free traces even when zoomed close in on areas of interest. 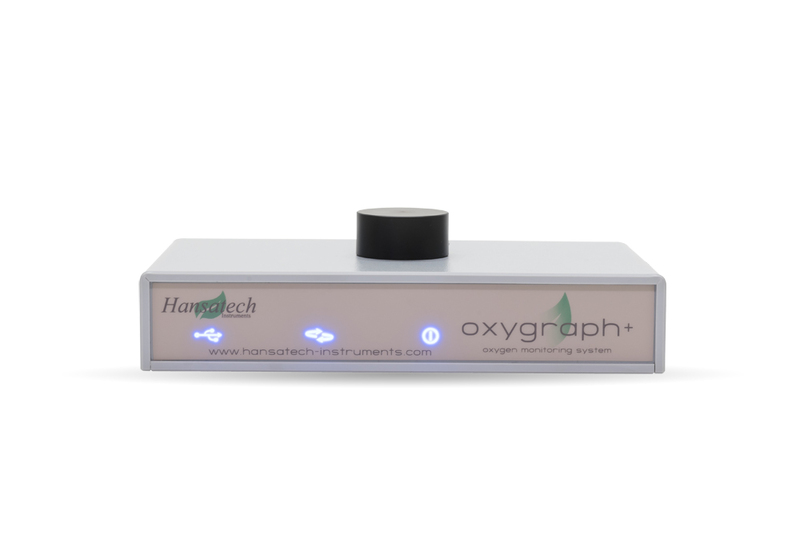 Oxygraph+ allows real-time graphing of signals from auxiliary inputs and ion-selective electrodes. 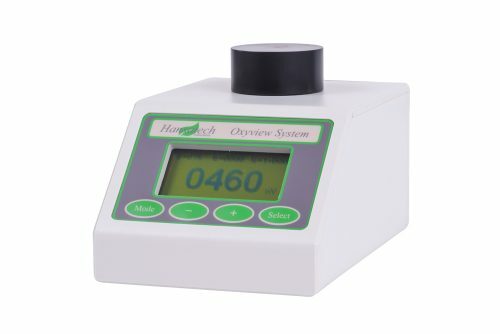 This allows comprehensive analysis of oxygen activity simultaneously with signals such as pH, TPP+, calcium, potassium and hydrogen ions. 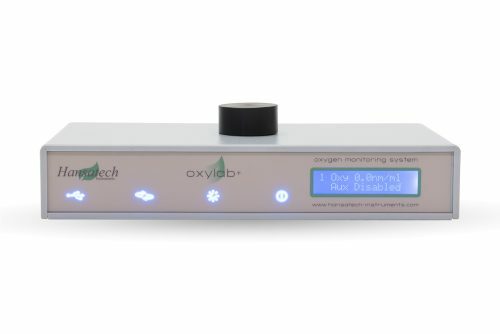 Up to 8 individual Oxygraph+ control units may be linked to a single PC and operated simultaneously from OxyTrace+ software providing a powerful, multi-channel system. OxyTrace+ is a multi-function Windows® program supplied with our range of PC-operated electrode control units for system configuration, calibration, data acquisition and analysis. In liquid-phase systems such as Oxygraph+, Oxytherm+, Chlorolab 2+ and Chlorolab 3+, an automated 2-step calibration routine guides the user quickly and effectively through the system calibration process using electrode values measured from air-saturated and deoxygenated water. For gas-phase systems such as Leaflab 2+, an automated 3-step calibration routine using electrode values measured from ambient air, ambient +/- 1ml of injected/removed ambient air and a further measurement of ambient air is employed. For electrode control units that provide automated light source control in systems such as Oxytherm+P, Chlorolab 2+, Chlorolab 3+ and Leaflab 2+, OxyTrace+ allows simple configuration of comprehensive PFD tables consisting of up to 20 individual light steps. Light intensity adjustments are performed automatically during the measurement. OxyTrace+ also allows calibration of the light source from a simple software routine. This requires the QTP1+ PAR/temperature sensor to be connected to the rear of the electrode control unit and placed into the reaction vessel prior to the addition of any liquids. In the Leaflab 2+ gas-phase system, calibration of the LH36/2R light source requires manual input of measured values at each individual calibration intensity step using the QSRED quantum sensor. A tabbed interface allows a simple transition between the different data views including oxygen electrode (and if configured, auxiliary and external ion-selective electrode) realtime output, a split screen showing realtime rate of change above the oxygen signal and tabulated numerical data. 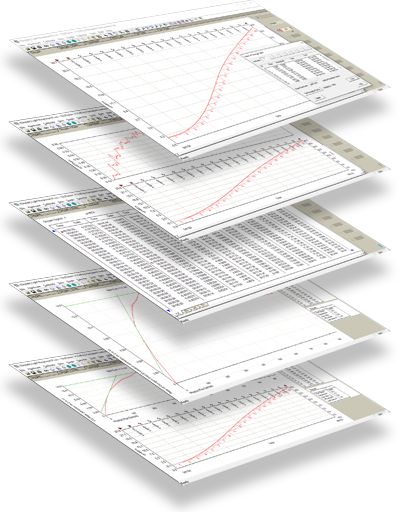 Post-acquisition analysis tools allow automatic calculation of oxygen rates from user-defined rate intervals. 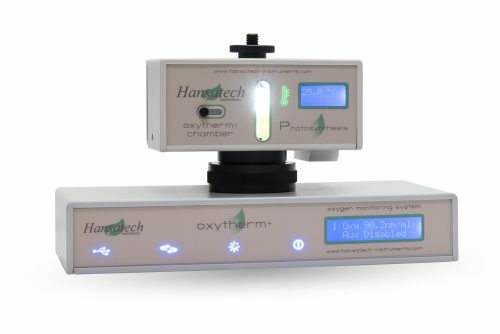 For Oxytherm+P, Chlorolab 2+, Chlorolab 3+ and Leaflab 2+ systems, additional analysis tools automatically calculate rates of change for defined PFD light steps with a calculation of quantum yield presented at the end of a measurement. All files are saved as Comma Separated Values (CSV) data files opening effortlessly in external data processing packages such as MS Excel®. OxyTrace+ will run on all supported Microsoft operating systems. Power: 12V dc @ 100mA, 90VAC – 264VAC @ 1A.